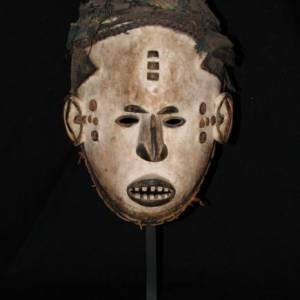 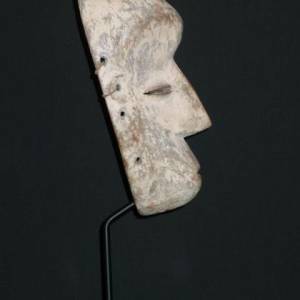 Ceremonial dance mask from the Igbo people (possibly the Izza subgroup) of southeastern Nigeria. 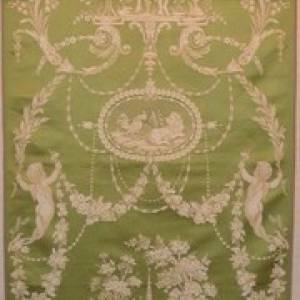 Late 19th-early 20th century. 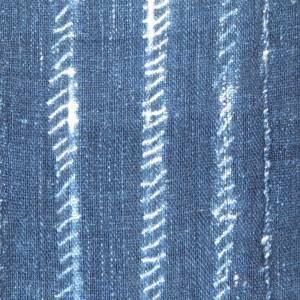 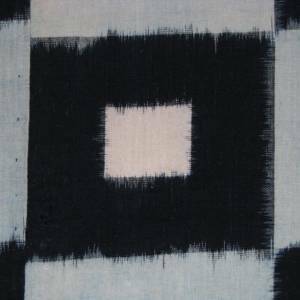 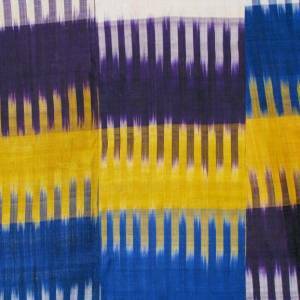 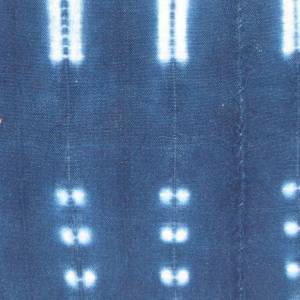 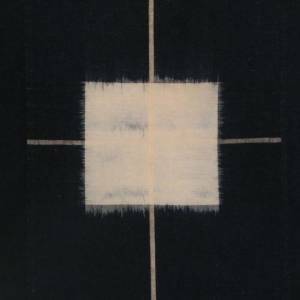 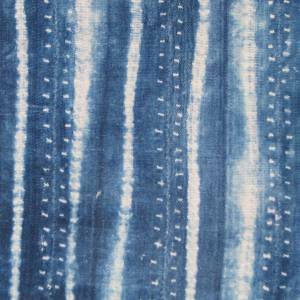 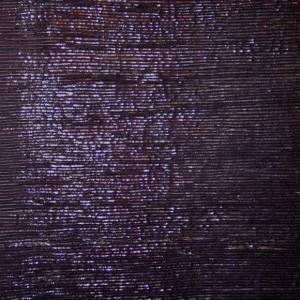 Mid-20th century African (Mali) woven indigo dyed (dark) cotton panel made up of narrow strips with a resist dyed pattern. 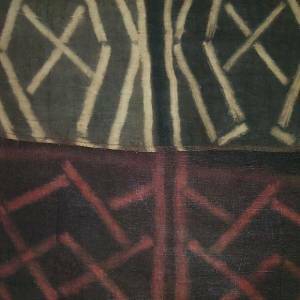 Mid-20th century African (Mali) woven indigo dyed (dark) cotton panel made up of narrow strips with a resist dyed pattern of fish. 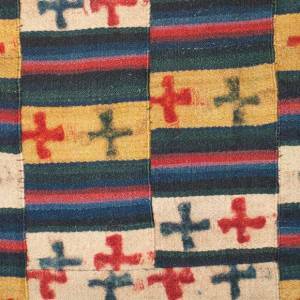 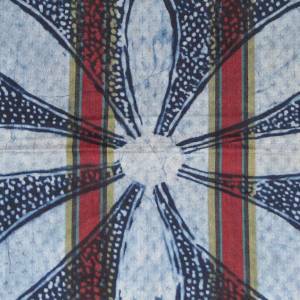 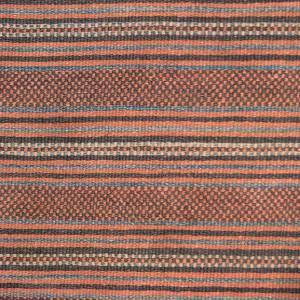 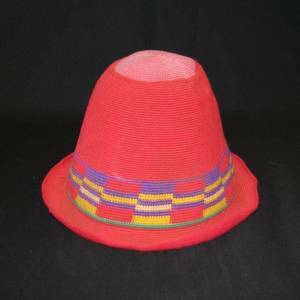 Mid 20th century Yoruba (Nigeria) adire eleko (resist dyed with casava flour) indigo cotton cover with red stripes. 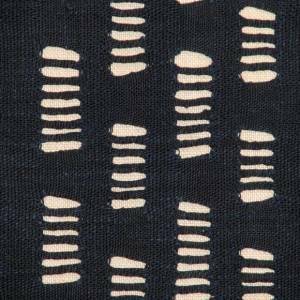 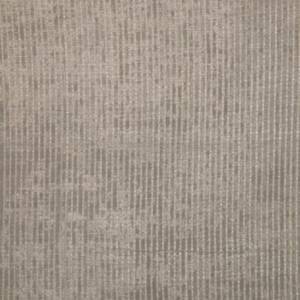 Mid-20th century African (Mali) woven indigo dyed (dark) cotton panel made up of narrow strips with a resist dyed pattern of dots & dashes. 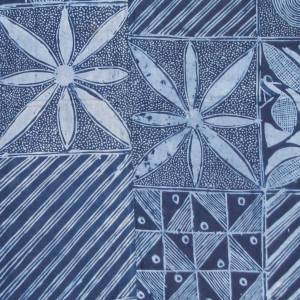 Mid 20th century Yoruba (Nigeria) adire eleko (resist dyed with casava flour) indigo cotton cover. 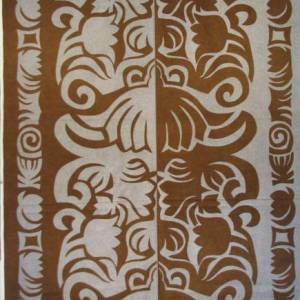 A pair of c. 1895 English Aesthetic Movement hangings. 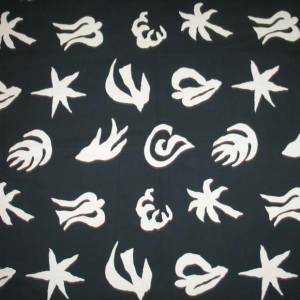 One panel of Kuba appliqué. 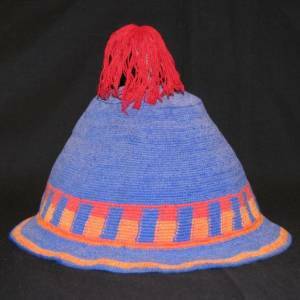 African Kuba ladies' ceremonial skirt. 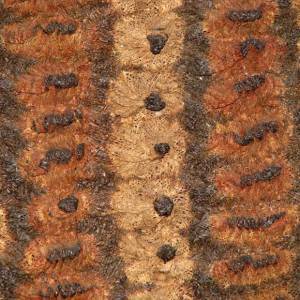 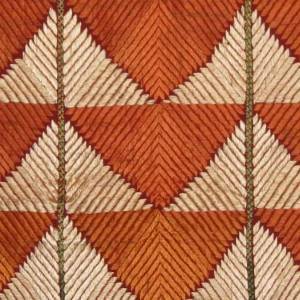 African Kuba (Bushong) man's ceremonial skirt. 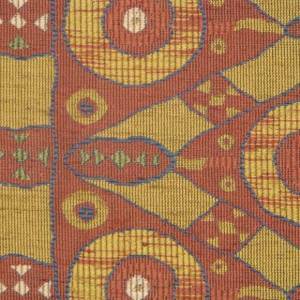 First half of the 20th century Kuba ceremonial skirt from the Congo. 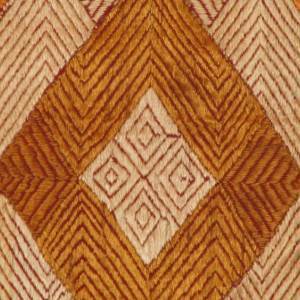 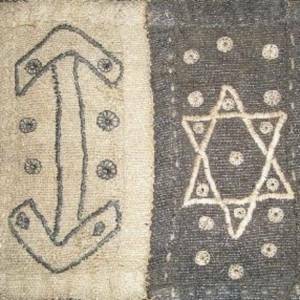 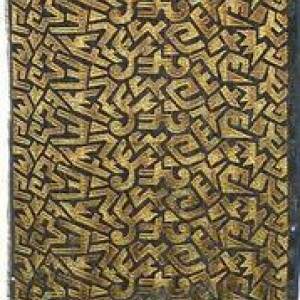 Kuba 'velvet,' a raphia cut-pile embroidery panel from the Congo. 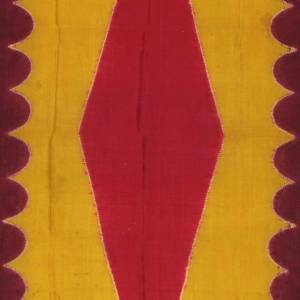 A late 19th century long rafia ceremonial skirt made by the Kuba people. 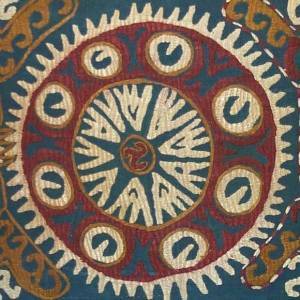 c. 1900 Fez, Morocco embroidered cover. 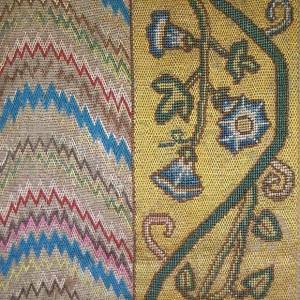 First half of the 20th century kercheif made by the Dida people. 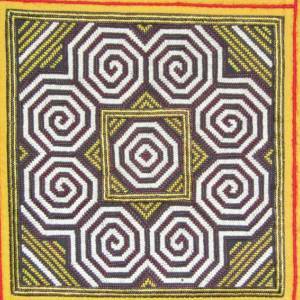 First half of the 20th century kerchief made by the Dida people. 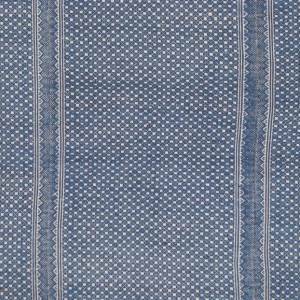 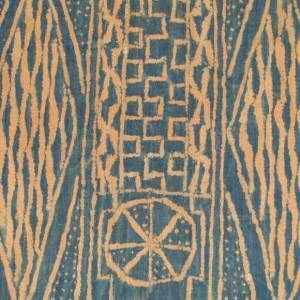 A rare early 20th century cotton indigo shawl from Nigeria. 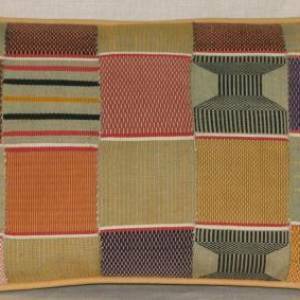 One pillow made from early 20th century Ewe cloth, Ghana, Africa. 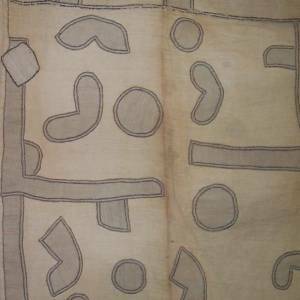 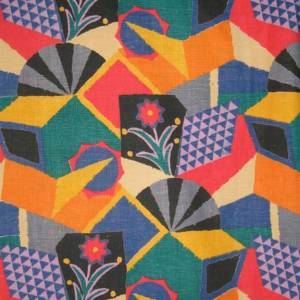 Mid 20th century Nigerian "Yoruba Aso Oke" cotton cloth. 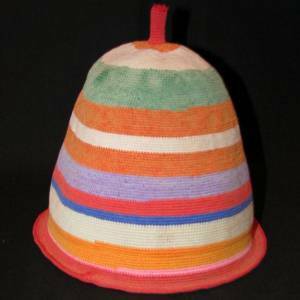 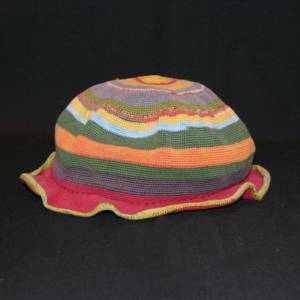 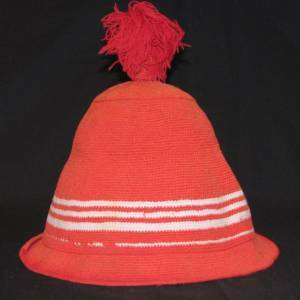 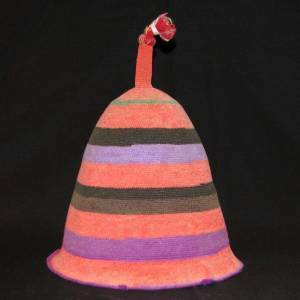 Ethiopian pilgrim's hat, c. mid 20th century. 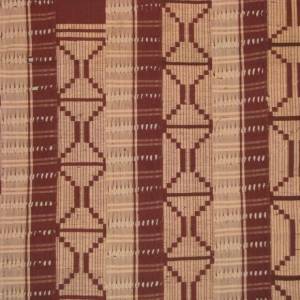 A mid 20th century Nigerian 'Yoruba Aso Oke Cloth' brown cotton with eyelets with surface weft geometric pattern in off while cotton thread. 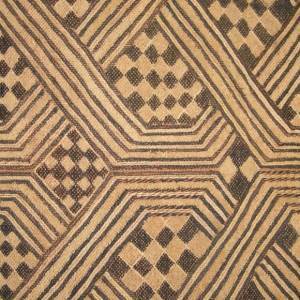 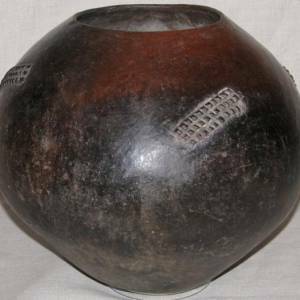 First half 20th century Kuba (D.R. 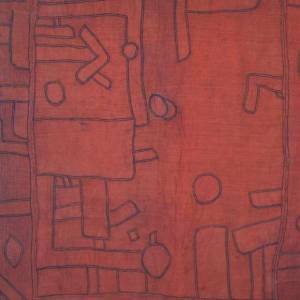 Congo) 'velvet' and embroidered panel. 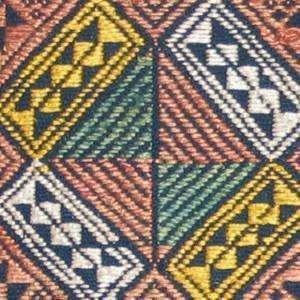 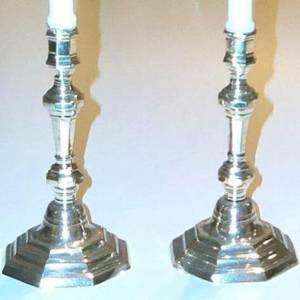 First half of the 20th century Kuba (D.R. 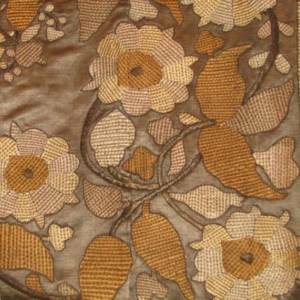 Congo) 'velvet' and embroidered panel. 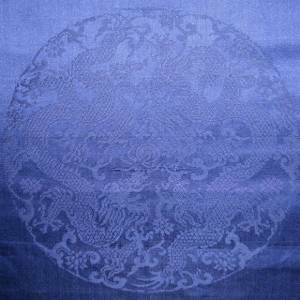 18th century Tibetan kesa (Buddhist priest's garment), Mounted. 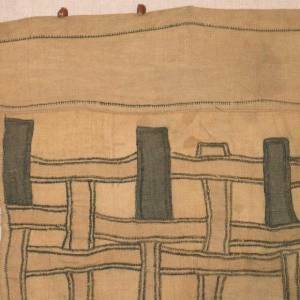 Tibetan wool apron, 1st quarter of the 20th century. 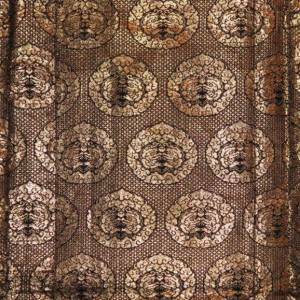 Late 19th century Chinese brocade. 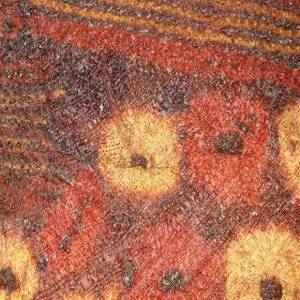 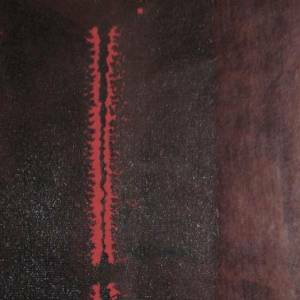 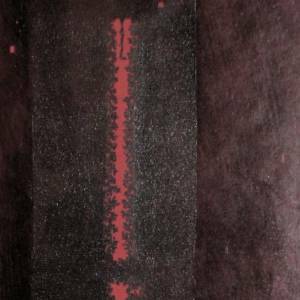 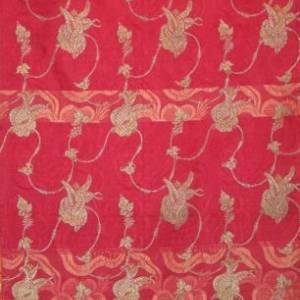 Circa 17th century (early Qing Dynasty) rust red silk voided velvet. 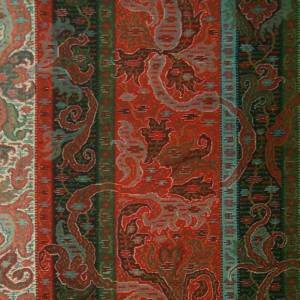 Late Ming Dynasty (1368-1643) red ground polychrome damask. 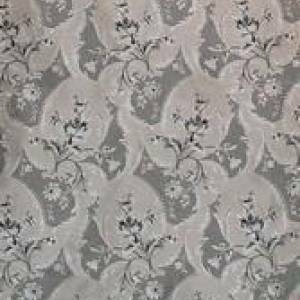 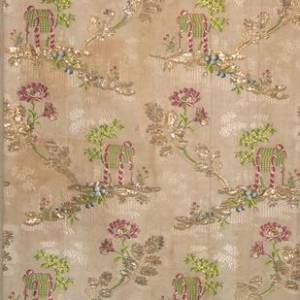 c.1890's very fine Chinese (Shanghai) white silk damask. 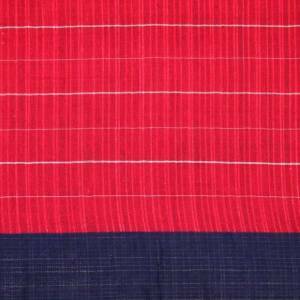 20th century Chinese (Miao Minority) accordian pleated cotton skirt. 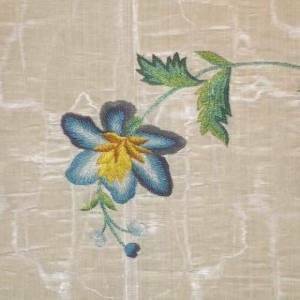 c. 1790 Chinese (Macao) silk embroidery on a cream silk ground. 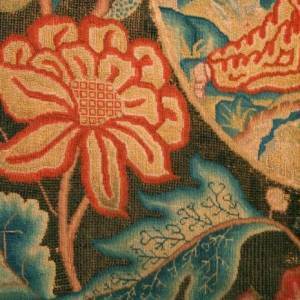 Chinese Ming dynasty (1368-1644) silk uncut velvet. 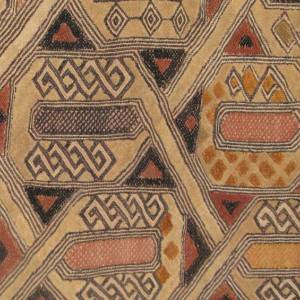 Mid 20th century Central Asian silk cover. 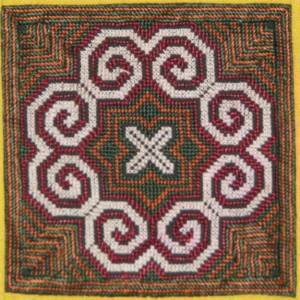 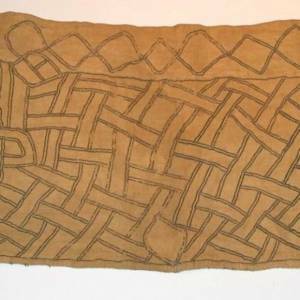 Late 19th or early 20th century wedding blanket by Buyi minority group. 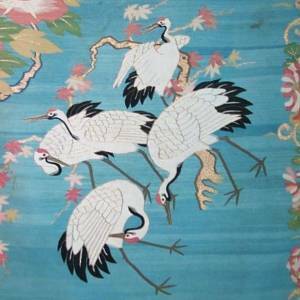 c.1860 Chinese export (Macao) silk polychrome embroidered bed cover. 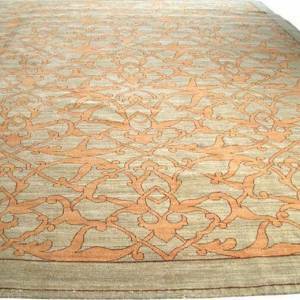 19th century Chinese export (Macao) champagne colored silk bed cover. 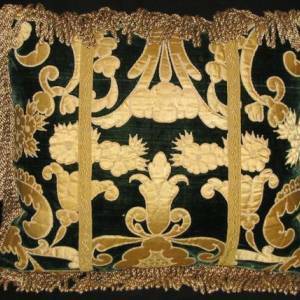 18th Century Chinese bottle green satin brocade. 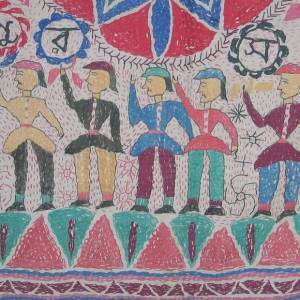 Mounted early 20th century wedding blanket by Buyi minority group. 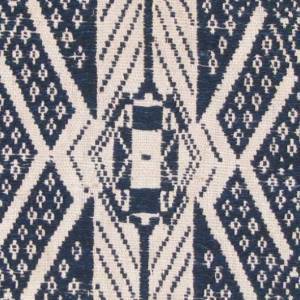 Early 20th century wedding bedcover woven by the Dong people. 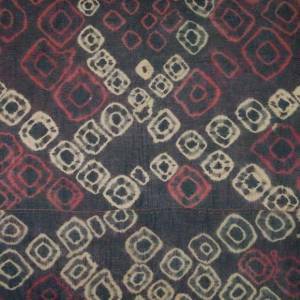 Early to mid 20th century from Guizhou Prov., China, Miao people, cotton wedding bed cover. 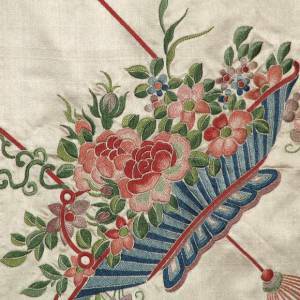 c. 1930 Chinese Minority (Miao) cotton embroidered and appliqued shoulder cover. 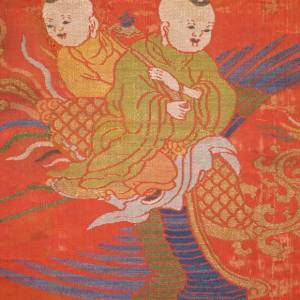 1930 Chinese Minority (Miao) embroidered and appliqued cotton shoulder cover. 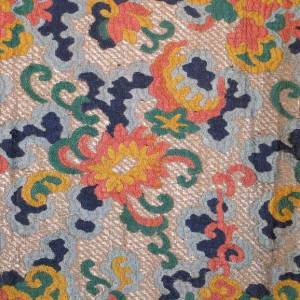 C. 1930 Chinese Minority (Miao) embroidered and appliqued cotton shoulder cover. 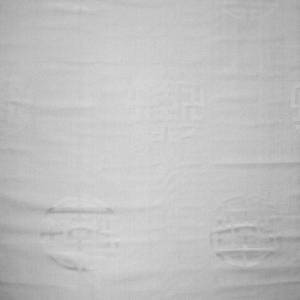 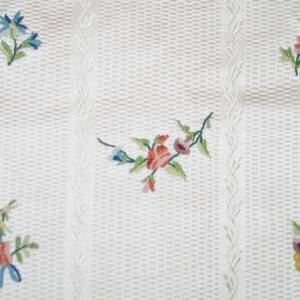 Early to mid 20th century 2 panel wedding bed cover with weft faced compound weave and suplementary weft weave. 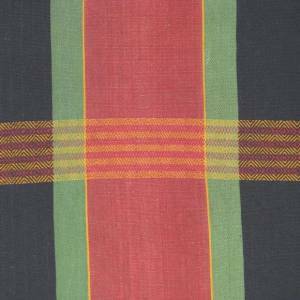 Chinese cotton woven striped blanket. 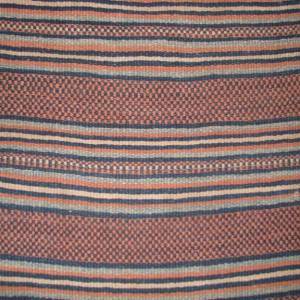 Mid 20th century Chinese flat-woven colored banded wool blanket. 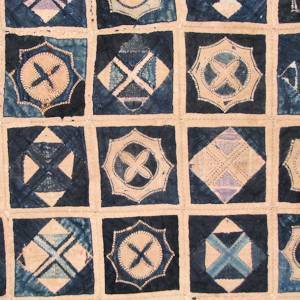 Mid 20th century Chinese Miao Minority coverlet for a child with patchwork of indigo squares joined together. 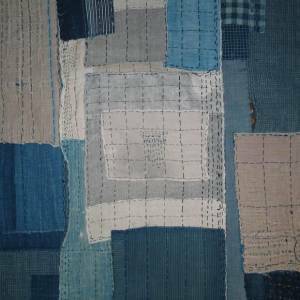 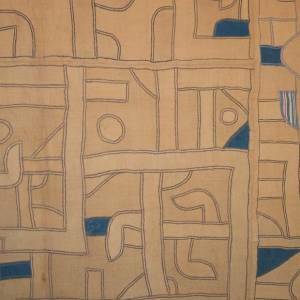 Mid-20th century Chinese Minority (Miao )panel with a patchwork of indigo blue squares joined. 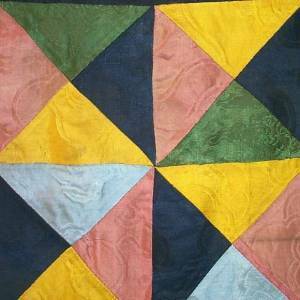 Early 20th century cotton N.E. 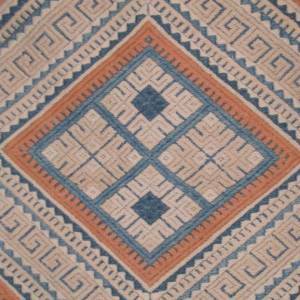 Laos cotton cover. 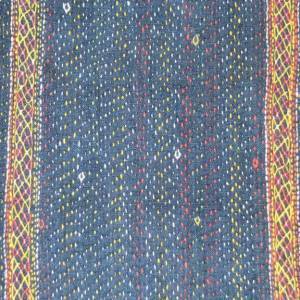 Early to mid-20th century from Guizhou Prov., China, Miao people, 2 panel cotton wedding blanket. 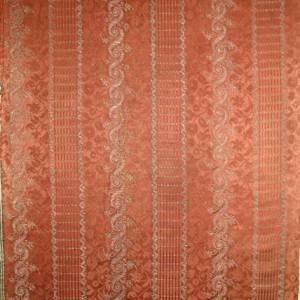 A late 19th century ceremonial cloth made from a lattice patterned silk damask. 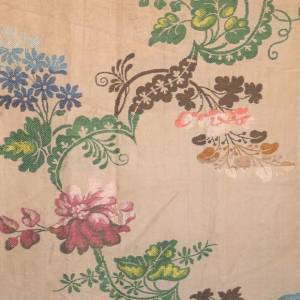 Persian Style, "Arabesques and Ispahan Flowers"
A very fine early 18th century English "Chinoiserie" silk embroidered picture. 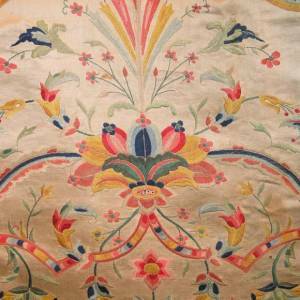 Circa 1740 English (Spitalfield's) cream silk brocaded in polychrome silk floral design. 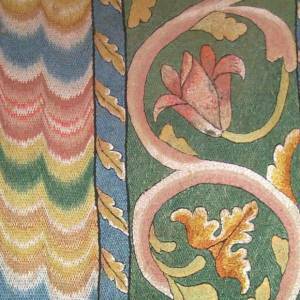 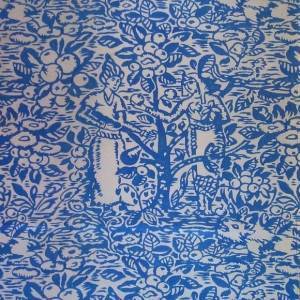 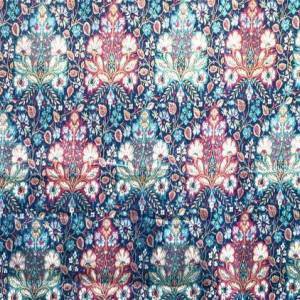 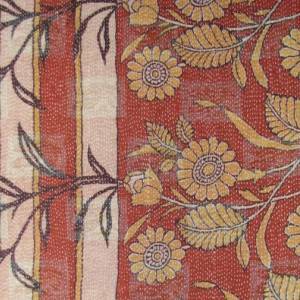 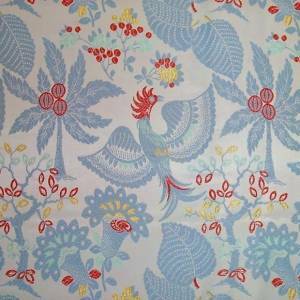 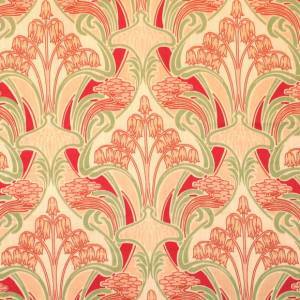 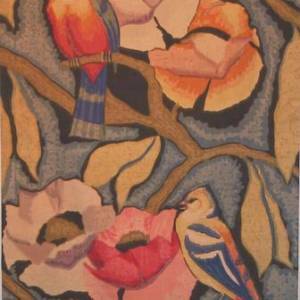 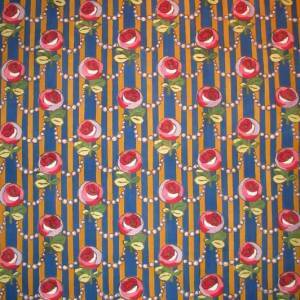 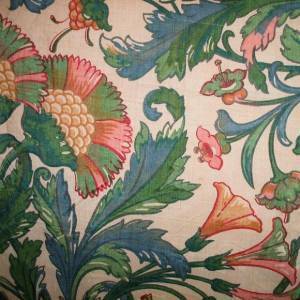 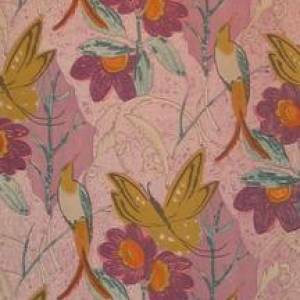 Printed silk sample after a design by William Morris. 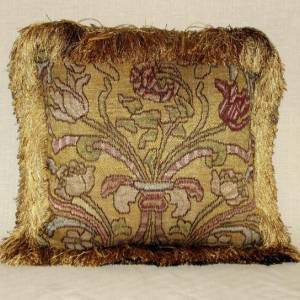 One of a pair of pillows made from late 19th century English (1890) embroidery. 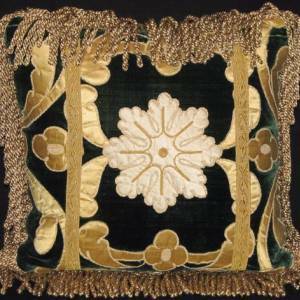 One of a series of 5 pillows made from late 19th century English (1890) embroidery. 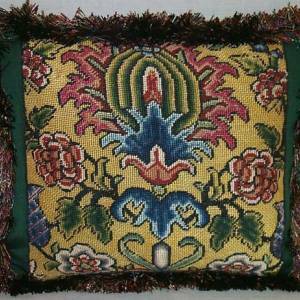 One pillow made from late 19th century English (1890) embroidery. 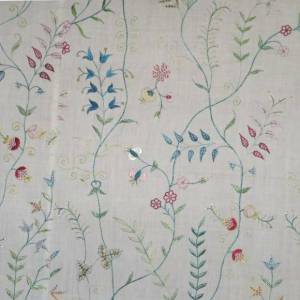 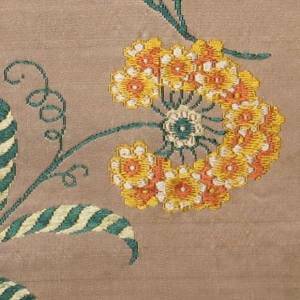 A panel from a dress of c. 1780's English fine polychrome silk floral embroidery. 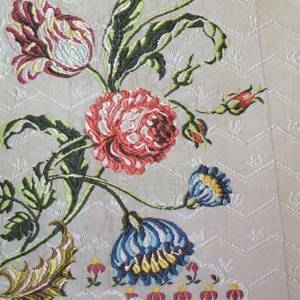 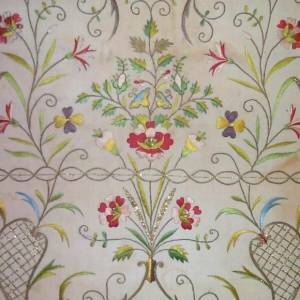 A panel from a dress of 1780's English fine polychrome silk floral embroidery. 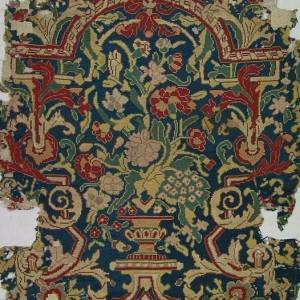 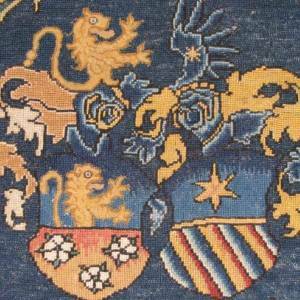 Late 17th century English appliqued polychrome embroidery. 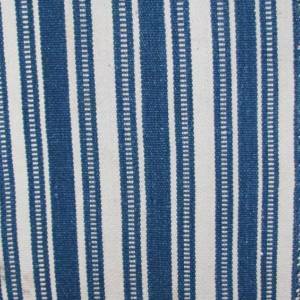 Late 18th century English Spitalfields blue and white striped brocade. 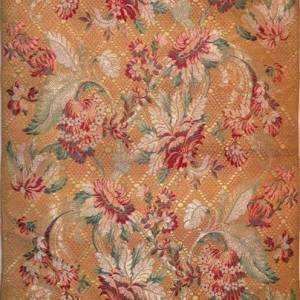 One of 2 pieces of c.1750 Dutch cream colored silk brocade. 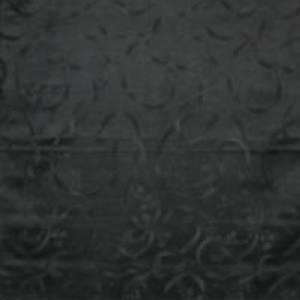 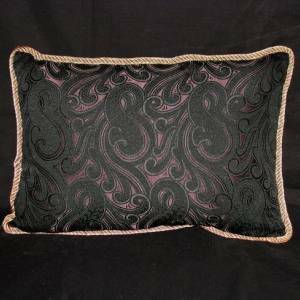 Late 19th c. English silk woven black damask with self colored pattern of ribbons. 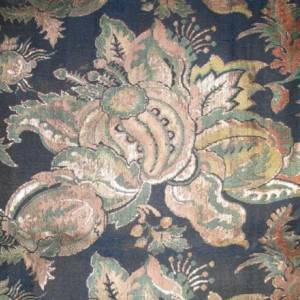 Late 19th century English cotton woven brocaded gauze panel. 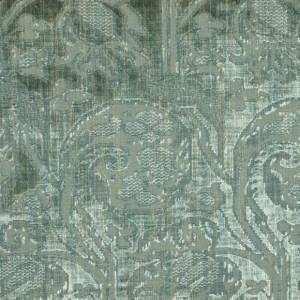 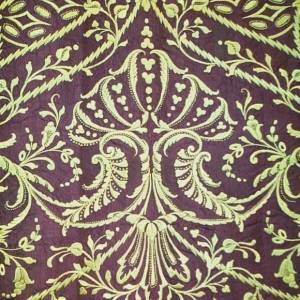 A late 19th century (1895) English silk woven brocade. 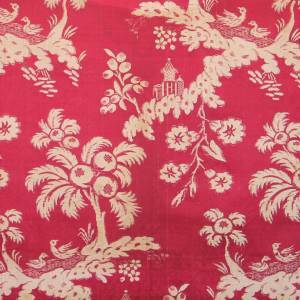 An excellent example of 18th century English (Spitalfields, c. 1740's) silk satin brocade. 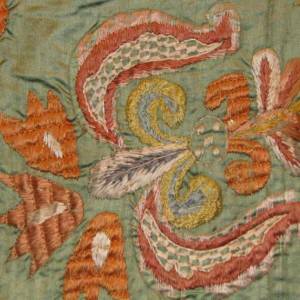 c. 1770's English silk embroidered apron. 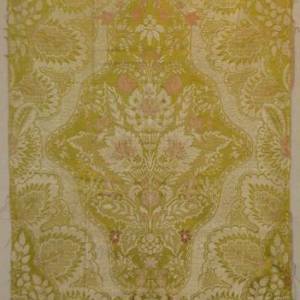 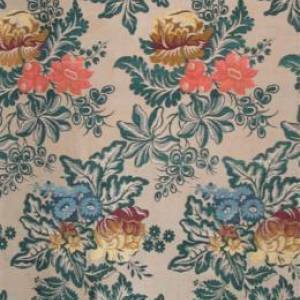 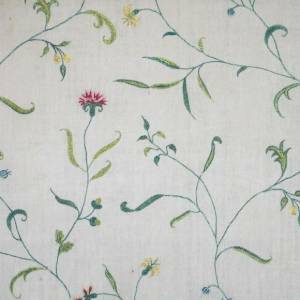 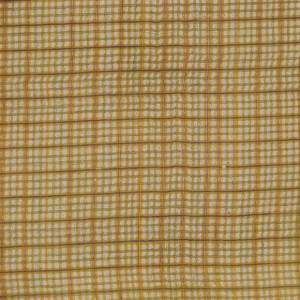 Late 18th century English cream colored silk with a vertical pattern. 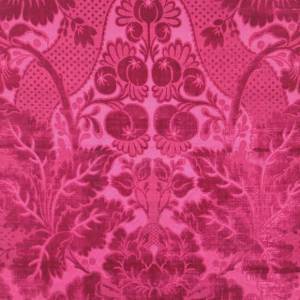 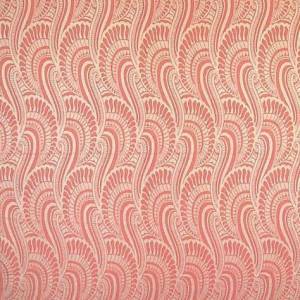 c. 1760 English (Spitalfields) raspberry pink silk damask. 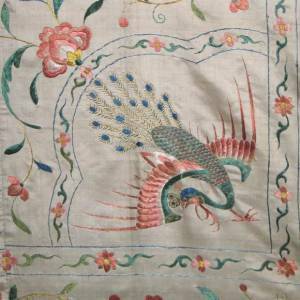 A pillow made from c.1720 silk embroidered panel. 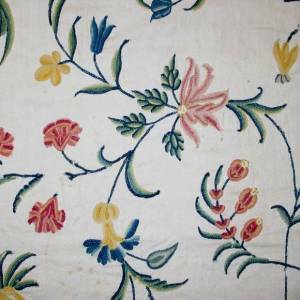 A very fine c. 1810 English roller printed cotton in blue on white with a repeated pattern of fashionably draped open windows, flowering baskets and Chinoiserie urns. 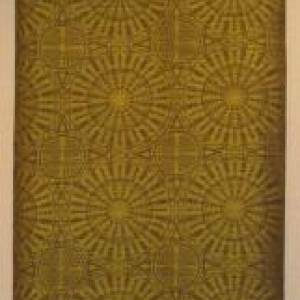 Design called "Open Window." 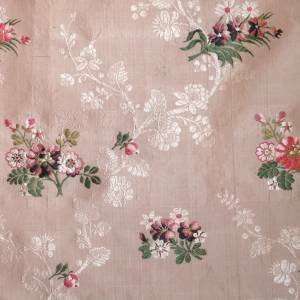 18th century English Spitalfields brocade from with pink and purple floral sprays against a pink on pink floral patterned ground. 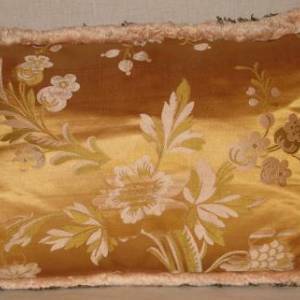 Pillow made from English 18th century Spitalfields brocade, in brilliant yellow and silver. 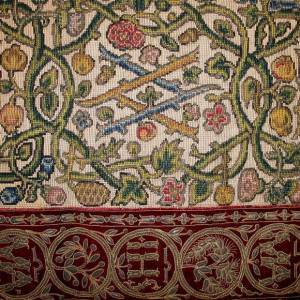 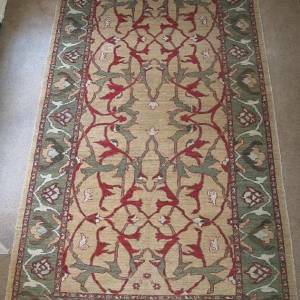 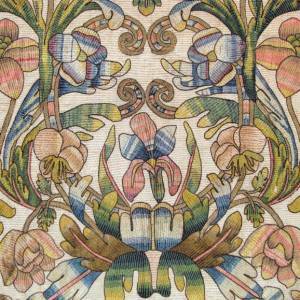 A very fine circa 1735 English crewelwork valence. 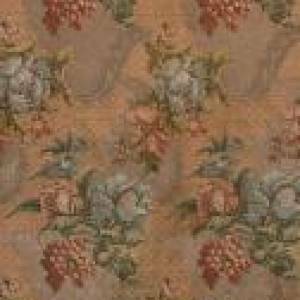 19th century (c. 1810) French joined panel of toile de Jouy in brown & white with repeating classical designs. 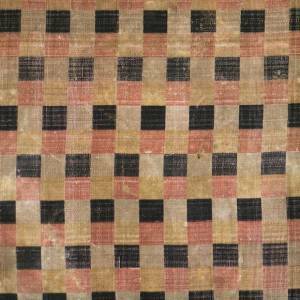 Circa 1720 French silk fabric in yellow and blue stripes outlined in red with white. 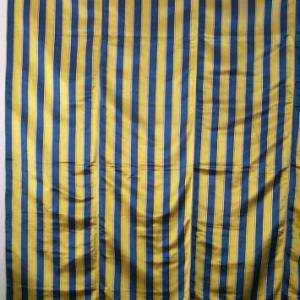 Four panels joined. 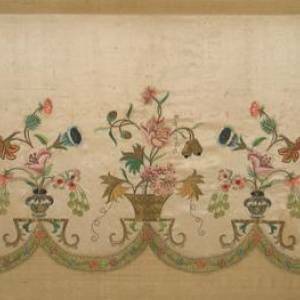 18th century (1780) French silk embroidery on cream colored silk. 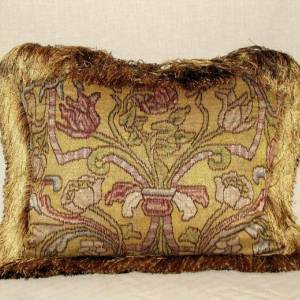 One of a pair of pillows made from 19th C. French burgundy colored silk velvet. 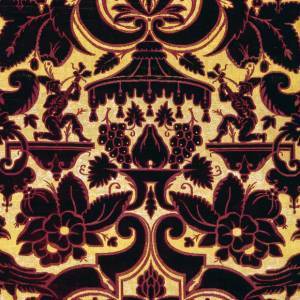 C. 1680-1690 French silk brocade, proto-bizarre. 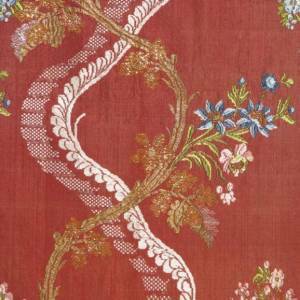 French mid 18th century silk brocade. 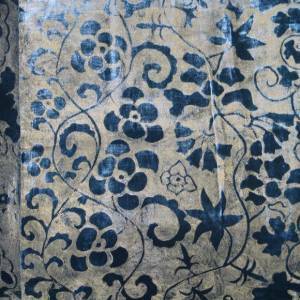 18th century French silk brocade. 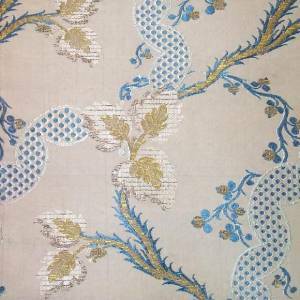 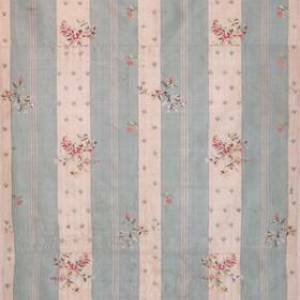 Circa 1760 French (Lyon) silk brocade with an off-white background, blue stripes, and brocaded with a vertical budding vine. 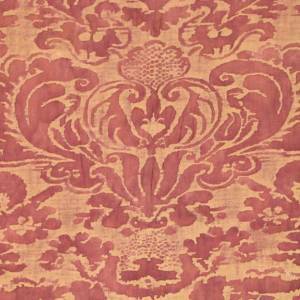 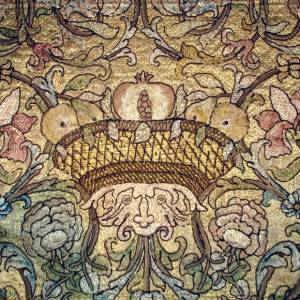 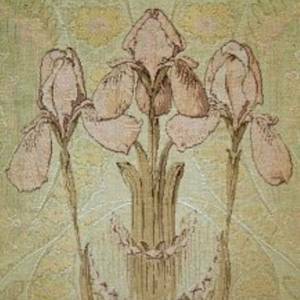 Woven in 1979 by Prelle, Lyon, France, silk and linen lampas in a musky rose color after an 18th century design. 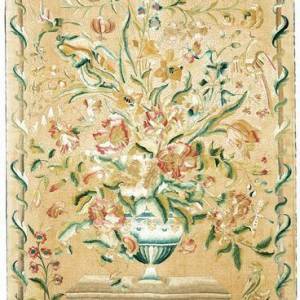 Early 20th century French green brocatelle with dolphins, urn and foliate vines, a complete design. 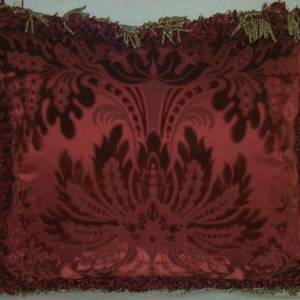 Late 19th century red cut and uncut silk velvet. 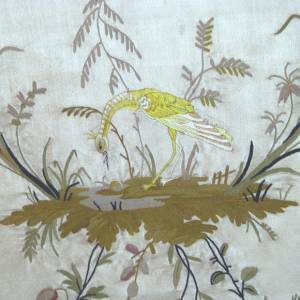 18th C. French chenille embroidered panel on a silk satin ground. 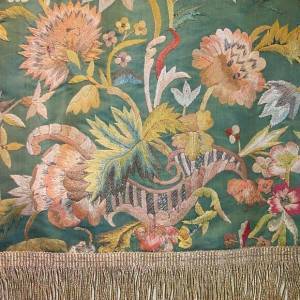 French 18th century panel of wool embroidery called tambour. 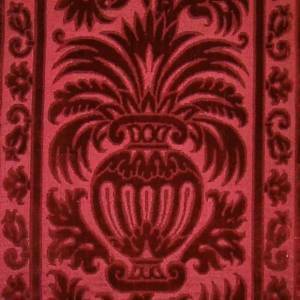 Circa 1890 French red voided velvet. 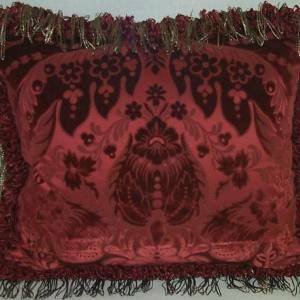 Circa 1890 French silk voided velvet on a red satin ground. 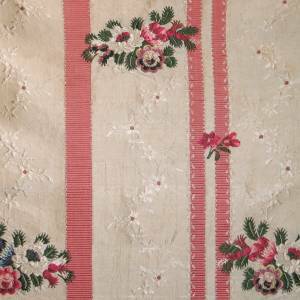 c.1760 French (Lyon) off-white ground silk brocade with two double and one solid pink stripe with floral clusters on a surface weft floral meander patterned ground in off-white. 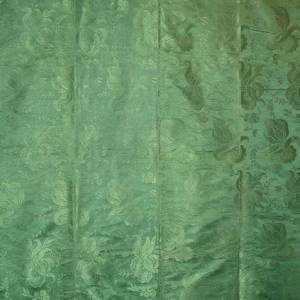 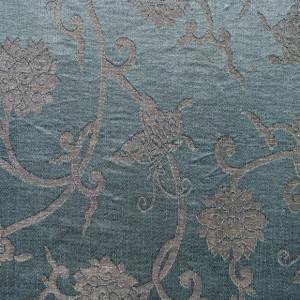 19th century French striated green silk velvet after a 16th century scrolling floral design. 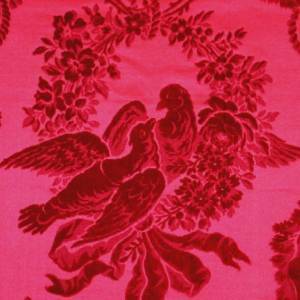 c.1740-50 French raspberry colored silk patterned with a white damask "Chinoiserie" design of repeated palms, pagoda, and birds. 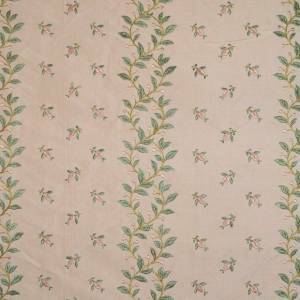 Late 18th century French cream colored silk embroidered with small rose buds. 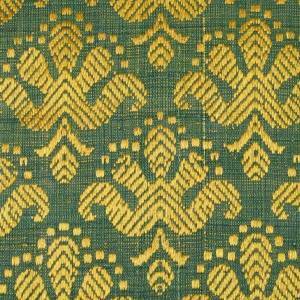 19th century French green and yellow silk brocatelle. 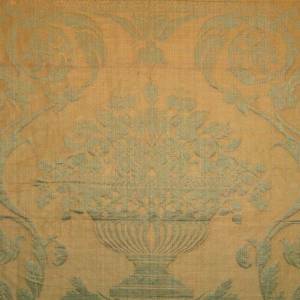 A rare c. 1750 French (Lyon) sapphire blue moire silk damask. 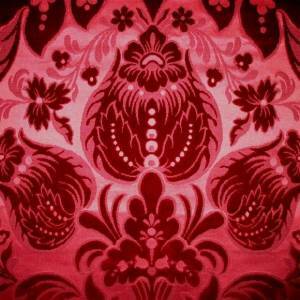 c. 1890 French red silk velvet. 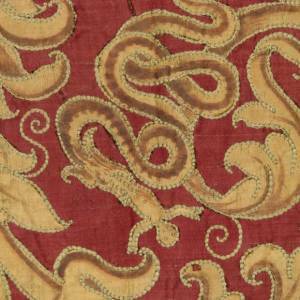 Early 18th century (173-40 Naturalism) French or Italian silk and metallic brocade. 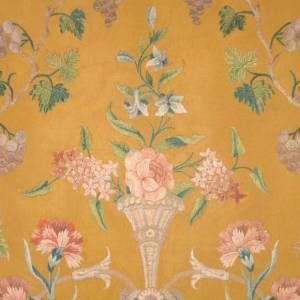 Circa 1700 French yellow silk skirt panel. 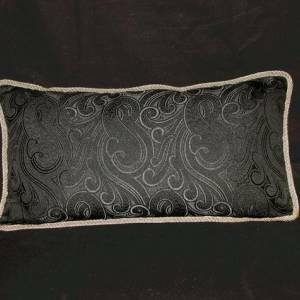 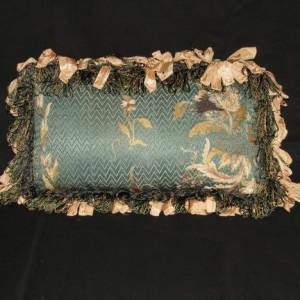 Pillow made from c.1900 French panel on a black ground with a foliate 'S' pattern. 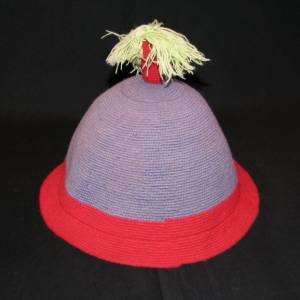 Sale: 50% off. 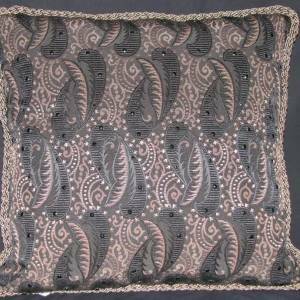 Pillow made from c.1900 French panel on black and dark brown ground with a foliate 'S' pattern. 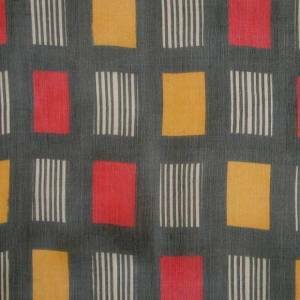 Sale: 50% off. 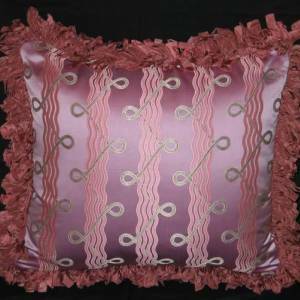 One of a pair of pillows made from a 1920's Art Deco French pink lavender colored silk damask panel. 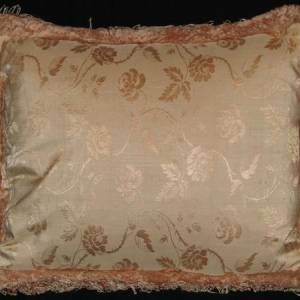 One of three pillows made from a c.1900 French silk. 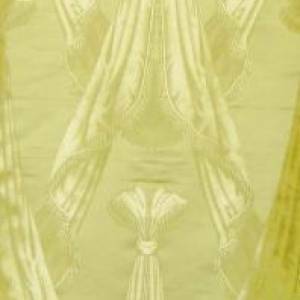 c. 1900 French yellow silk damask. 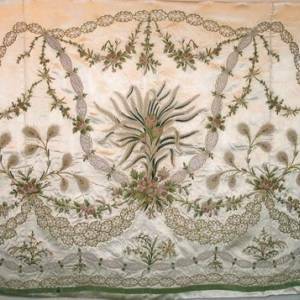 Mid 18th century (c. 1750) French silk with white damask background. 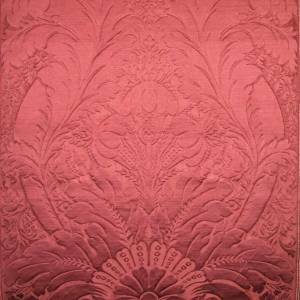 An opulent c.1870 French voided red silk velvet. 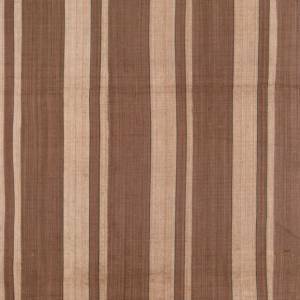 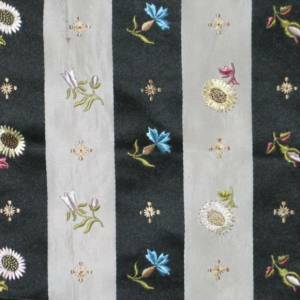 Last quarter of the 18th century French black and white striped silk taffeta. 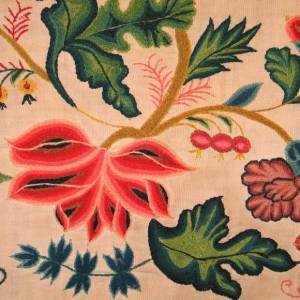 18th century French fine polychrome silk floral embroidery. 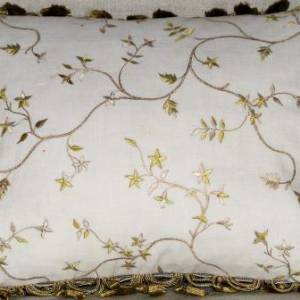 Late 19th century French (Collections Hamot, Lyon) bronze colored silk brocatelle with a design of scrolling vines, leaves, and flowers heads bursting from a floral urn. 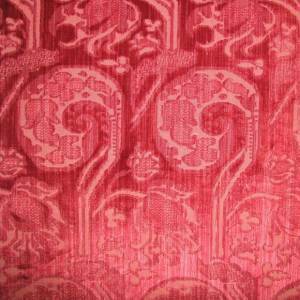 19th century French striated red silk velvet. 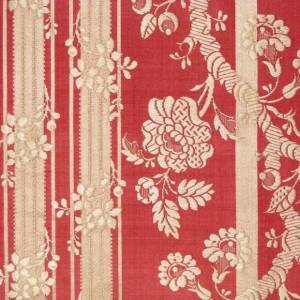 Late 19th century French red brocatelle. 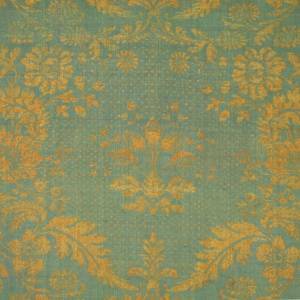 Late 18th century (1760) French brocaded silk taffeta. 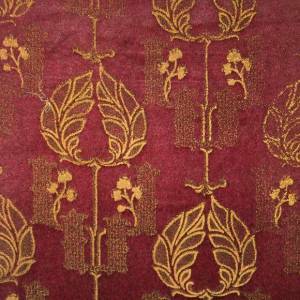 19th C. burgundy voided velvet in a small pattern of hanging lamps or censors with floral garlands on a gold ground. 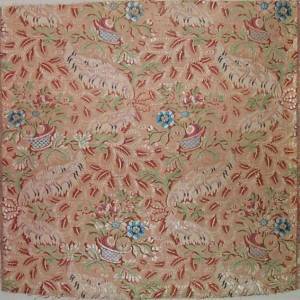 c.1720 French silk lace patterned brocade in ivory with details in pale pink, salmon, and rose-red on yellow satin ground. 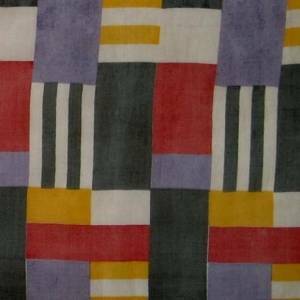 c. 1930's French Art Deco silk panel with an aubergine colored ground decorated with yellow patterns of wheels with geometric accents. 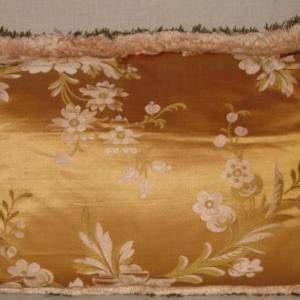 Pillow made from 19th century French damask of cream white ground with pink floral pattern. 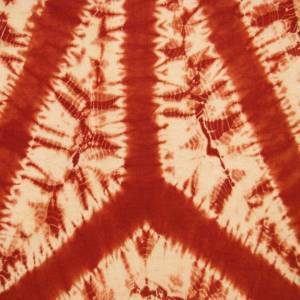 Sale: 50% off. 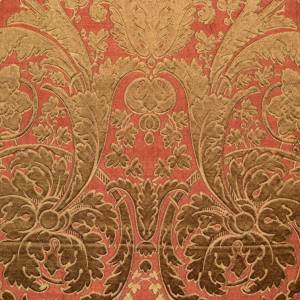 18th century gold silk damask. 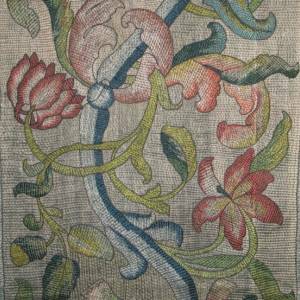 French embroidery after a design by Philippe de la Salle. 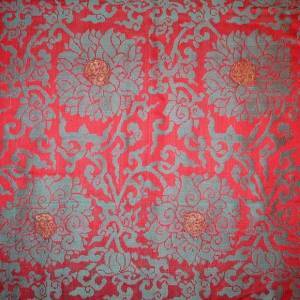 Circa 1880 French Jacquard loomed shawl. 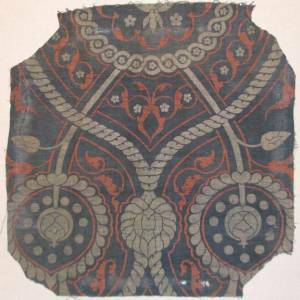 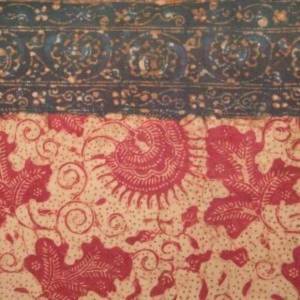 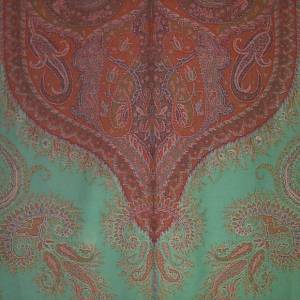 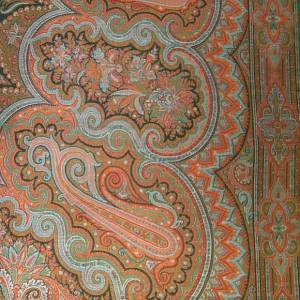 Turn of the century European jacquard loomed Kashmiri style paisley shawl. 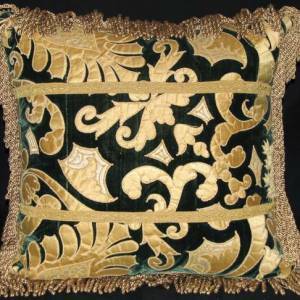 Pillow made from 18th century (c. 1750) Spanish or Italian applied yellow silk patterns on green silk velvet. 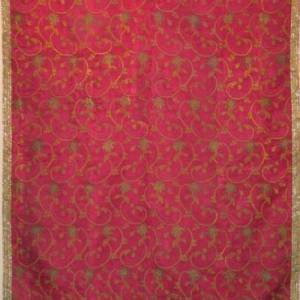 Early 16th century from Genoa, Italy, red silk voided velvet border. 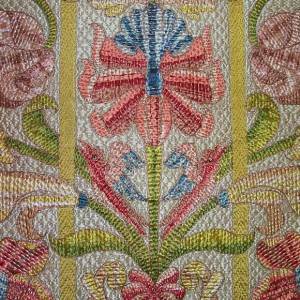 Late 17th / early 18th century Italian silk embroidered chasuble front. 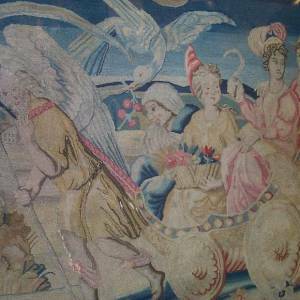 16th century Spanish beautifully embroidered orphrey. 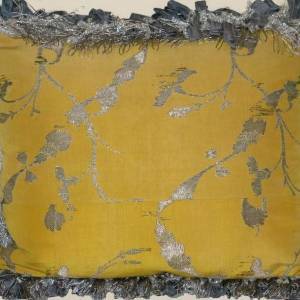 18th century Italian or Spanish green and gold silk lampas with a centralized floral seed pod design with dotted background framed by a leaf and floral meander. 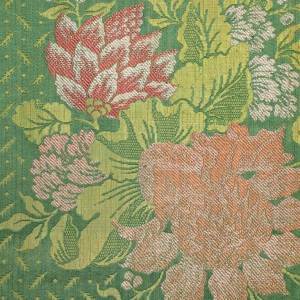 18th century Italian green silk brocade with large, peach colored flowers and silver/white flowers set on a green satin ground patterned with a tiny leaf and dot pattern. 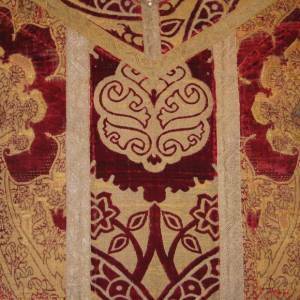 c. 1400-1500 Italian chasuble back with a central panel and top made of a rare design of Ottoman velvet. 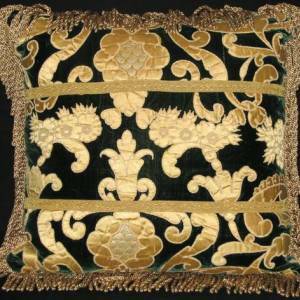 Pillow made from 18th century Italian green silk. 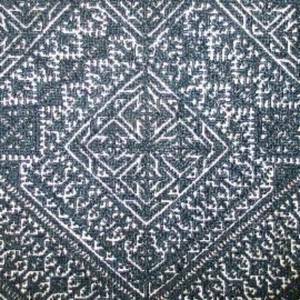 Sale: 50% off. 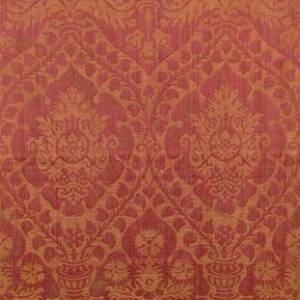 A very fine 17th century Italian voided red silk velvet. 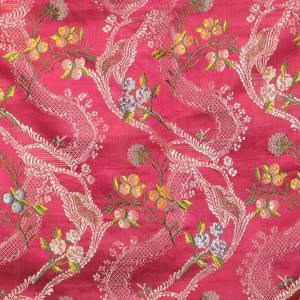 Early 18th century Italian or German raspberry color silk brocade decorated with images of flowers and berries with two different styles of lace meander. 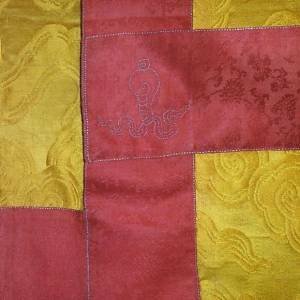 Made into a chasuble. 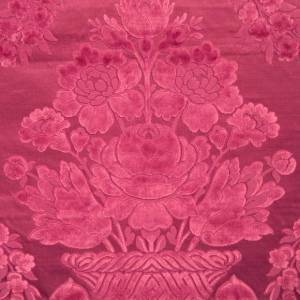 18th century Italian cut red silk velvet. 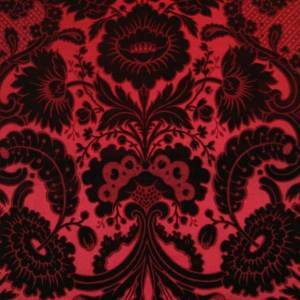 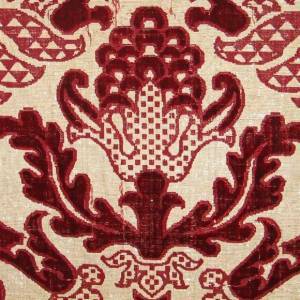 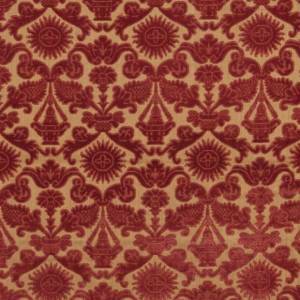 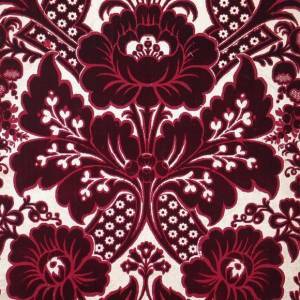 A late17th century Italian red silk, large patterned velvet. 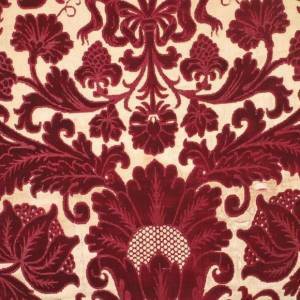 c. 1550 Italian (Florence) voided red silk velvet in an ogival pomegranate design. 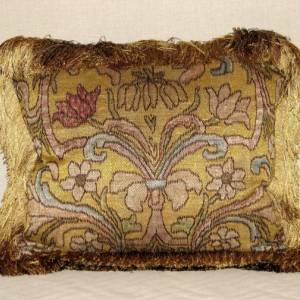 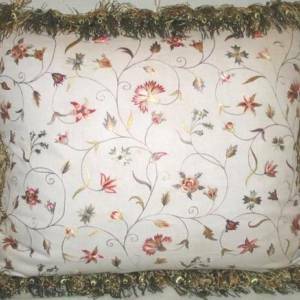 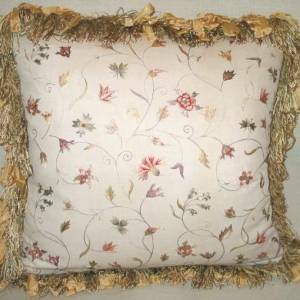 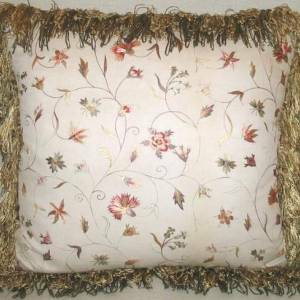 Pillow made from 18th century Italian silk needlepoint panel. 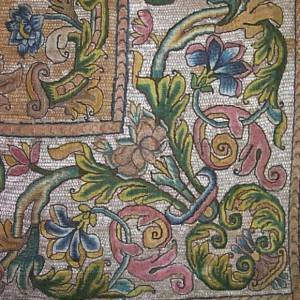 A pair of 17th century Italian polychrome silk floss embroidered column covers. 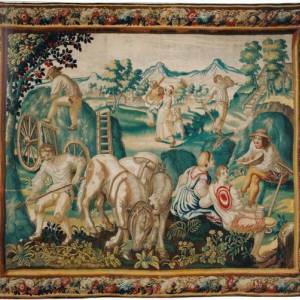 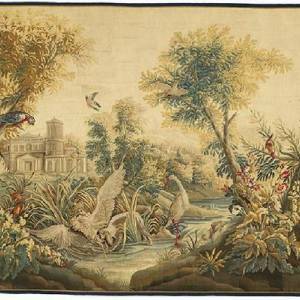 A delightful late 17th century Italian silk floss panel. 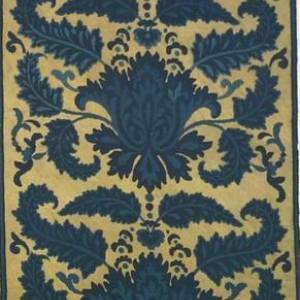 A rare late 17th century Italian or Spanish linen and silk brocatelle with a blue ground patterned with a yellow silk horizontal repeated stylized floral design. 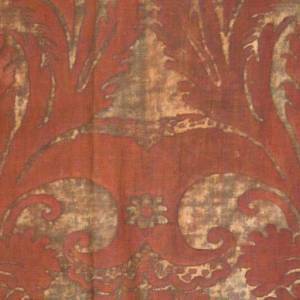 c. 1690 Italian burnt coral colored silk. 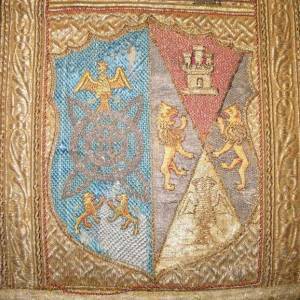 Early 18th century Italian or French chasuble back. 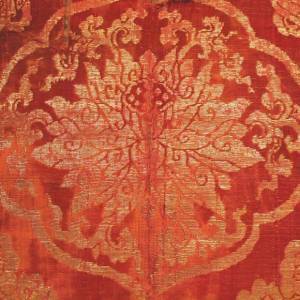 Late 17th century Italian hanging with a red silk ground and silk gold applique. 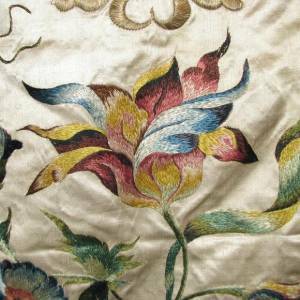 18th C. Italian silk floss embroidered antependium. 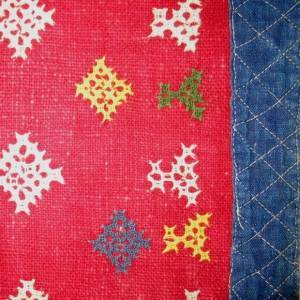 A 19th century Portuguese (Castelo Branco) embroidered coverlet made of homespun linen/flax and embroidered in silk floss thread. 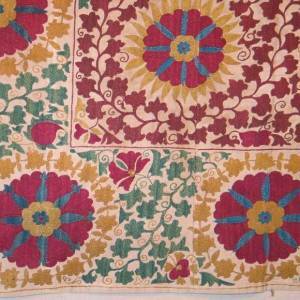 Silk embroidered coverlet. 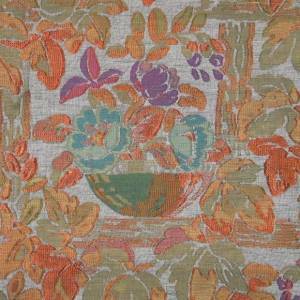 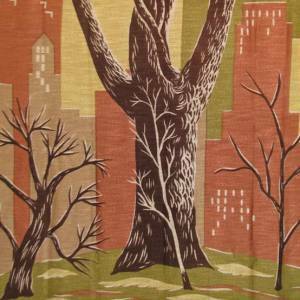 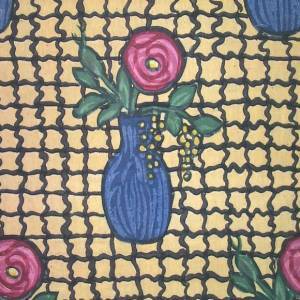 May be used as a table cover, a wall hanging, or a bed cover. 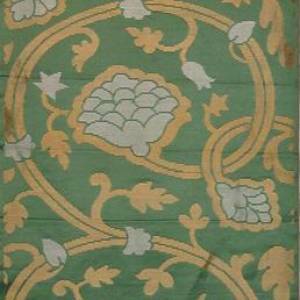 18th century Italian jade green silk panel embroidered in polychrome silk threads. 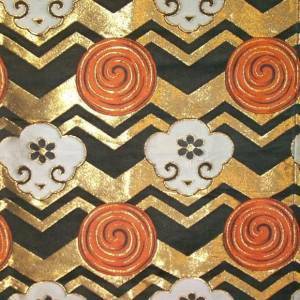 Circa 1900 Japanese tapestry weave cover in black, gold, orange and white. 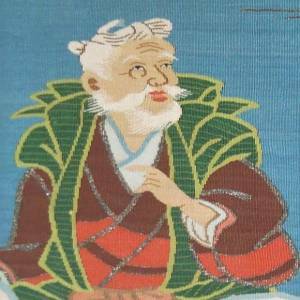 Early 20th century yukata stencil, framed on red board. 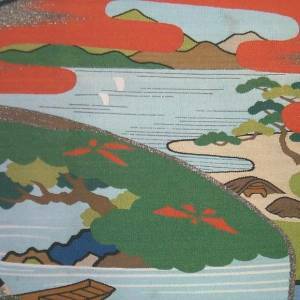 Early 20th century Japanese yukata stencil, framed on red mat. 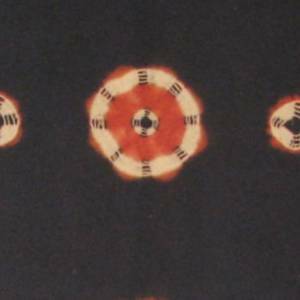 Late 19th century Japanese resist dyed wool felt. 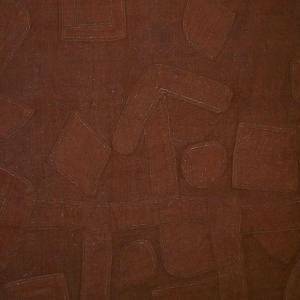 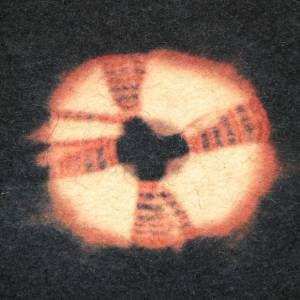 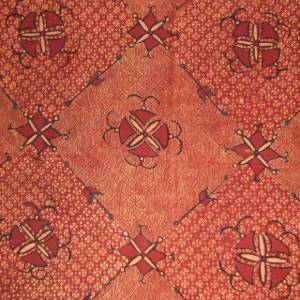 19th century Japanese resist dyed (shibori-zome) wool felt carpet (shibori-mosen) with a red field. 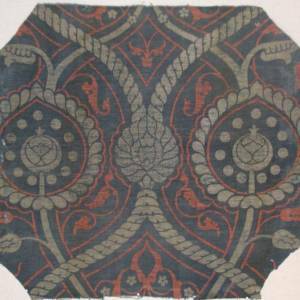 19th c. Japanese cotton futon cover called "Boro". 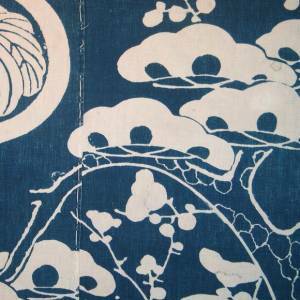 A Japanese, late Edo (1800-1860) cotton, rice paste resist dyed with sumi ink. 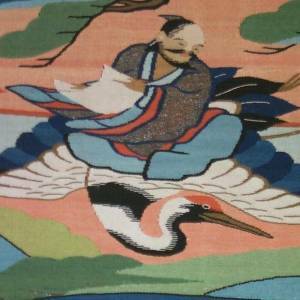 Tsutsugaki futon. 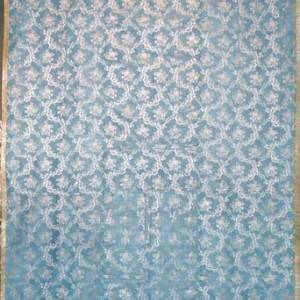 c. 1920's Japanese obi fabric blue (periwinkle) silk gauze brocade with gold star shaped leaves (maple leaves). 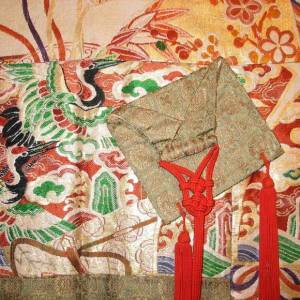 Early 20th century (Taisho) Japanese Buddhist monk's garment (kesa). 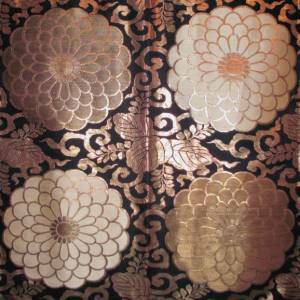 Late 18th century Japanese silk and metallic brocade. 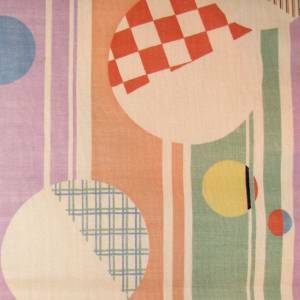 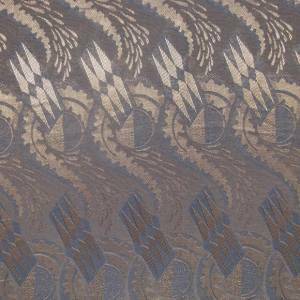 Art Deco Japanese silk printed obi. 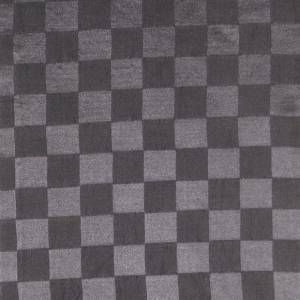 An unusual c. 1920's Japanese black silk satin checkerboard patterned obi. 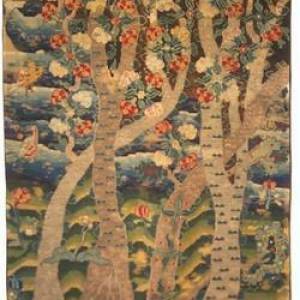 Late 19th century Japanese silk temple hanging. 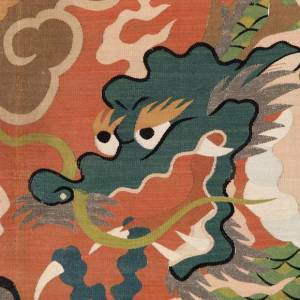 Early 20th century Japanese futon cover. 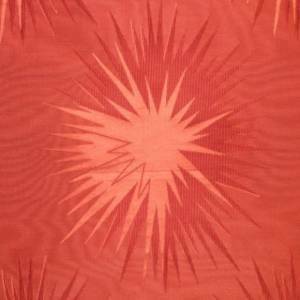 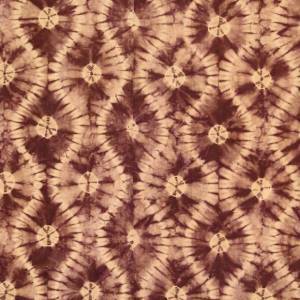 Early 20th century Japanese resist dyed (shibori) futon cover. 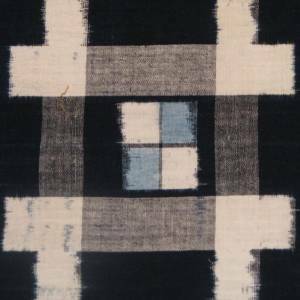 Early 20th century Japanese (Meiji period) cotton ikat futon cover with square designs in deep indigo blue, light blue, and white called, "Dancing Squares." 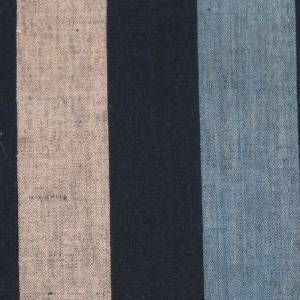 Early 20th century Japanese cotton striped futon cover with bold stripes in indigo blue, light blue and gray. 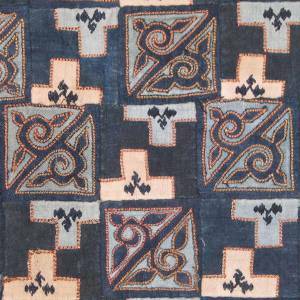 c. 1900 cotton futon cover natural indigo ikat. 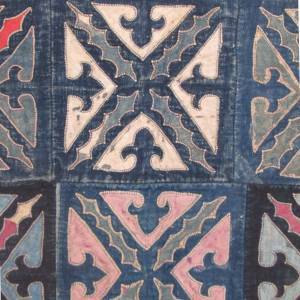 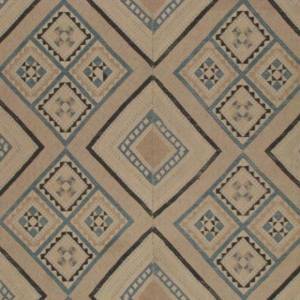 c. 1900 Japanese cotton futon cover, natural indigo ikat. 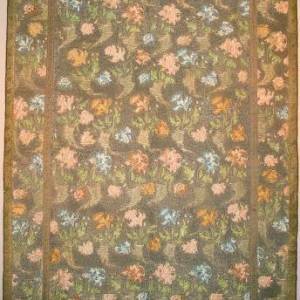 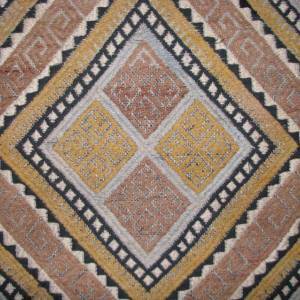 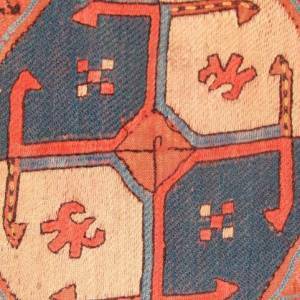 Late 19th century wool felt carpet called "mosen." 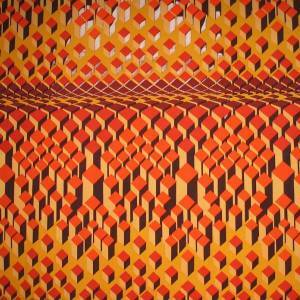 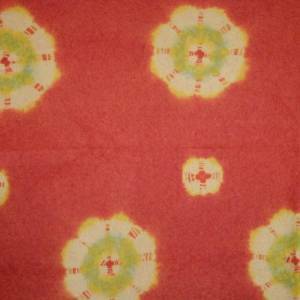 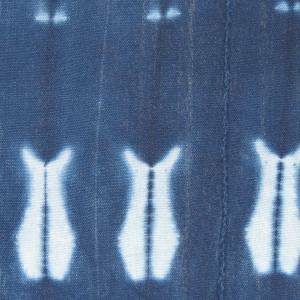 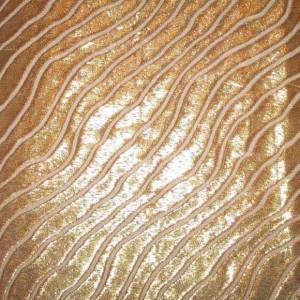 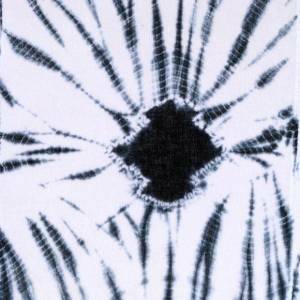 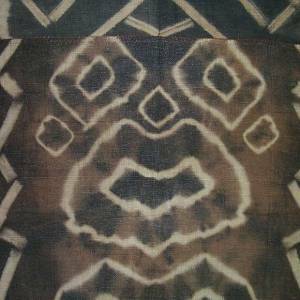 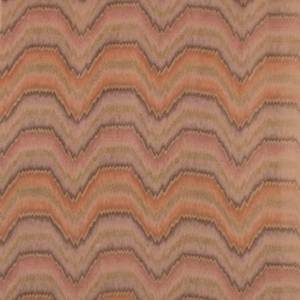 Japanese stencil patterned cotton and resist dyed to imitate ikat. 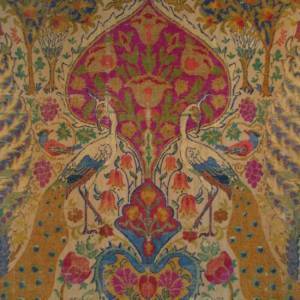 18th C. Zoroastrian (Persia, today Iran) embroidered panel. 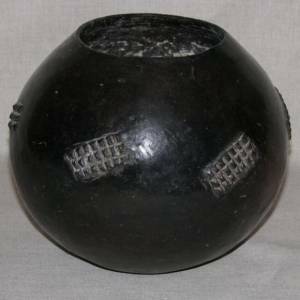 A late 19th century lawon. 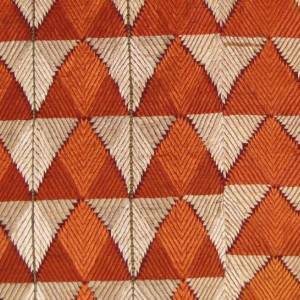 Late 19th century Nusa Penida sarong from Bali. 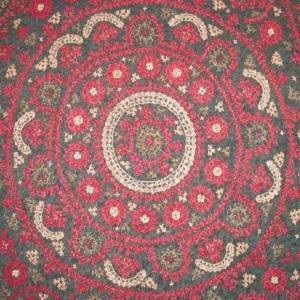 Modern reproduction Suzani from Uzbekistan. 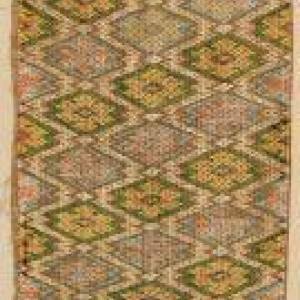 Late 19th century Armenian interlaced embroidery. 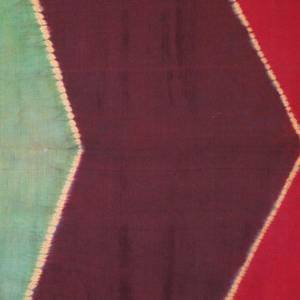 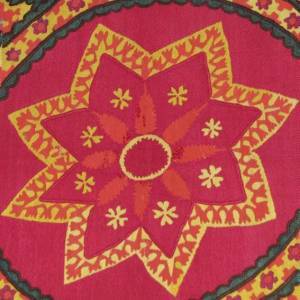 An early 20th century Sind, Pakistan red cotton ground shawl. 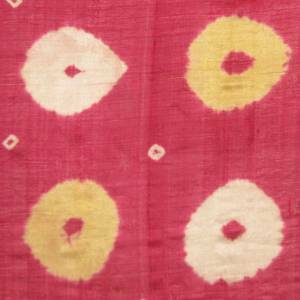 Early 20th century from Bangladesh, India bed cover called a kantha. 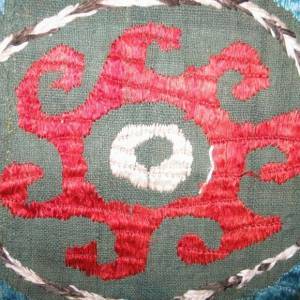 Pillow made from a c. 1900 Sind, Pakistan embroidered red cotton square. 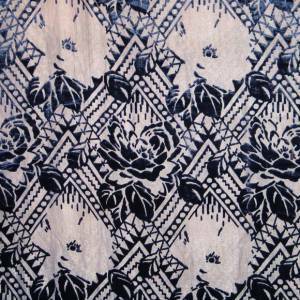 Early 20th C. Jambi batik/cotton skirt. 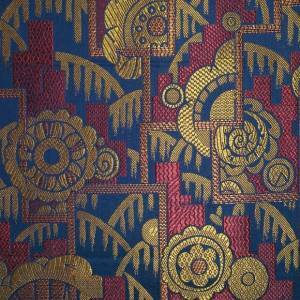 Early 20th century embroidered skirt panel. 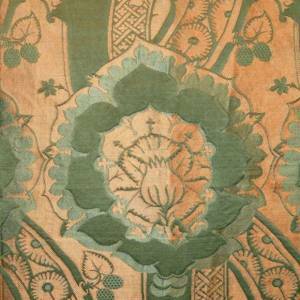 A late 18th century silk embroidered panel on a green cotton ground called a "kaitag" from Daghestan. 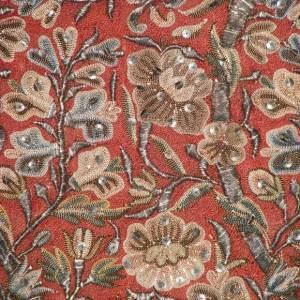 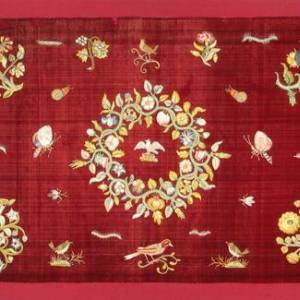 An 18th century Turkish red wool square embroidered in silk and metallic threads. 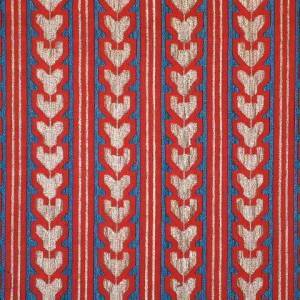 A late 19th century ceremonial presentation scarf (lawon) from Sumatra, Indonesia. 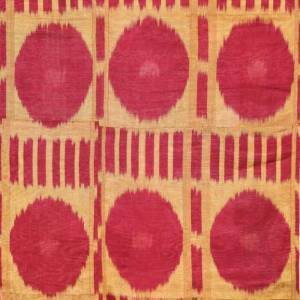 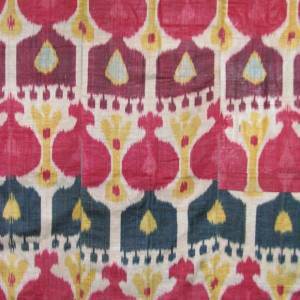 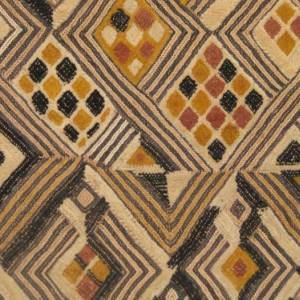 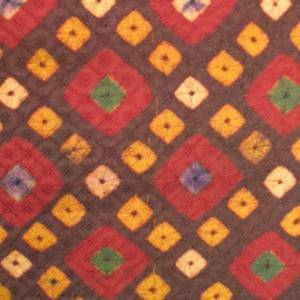 A late 19th/early 20th century silk Ikat from Uzbekistan. 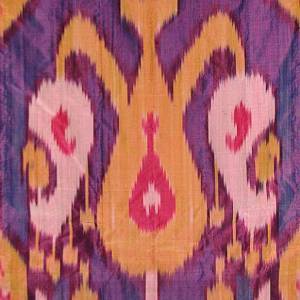 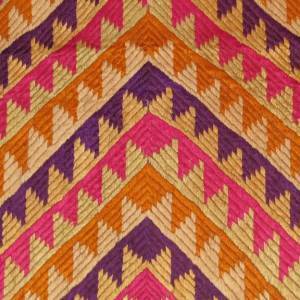 A late 19th/early 20th century dress of silk Ikat from Uzbekistan. 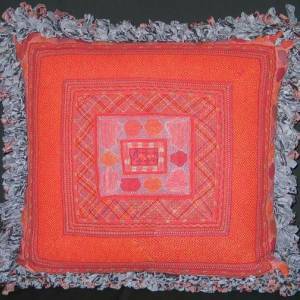 Hand quilted printed cotton cover. 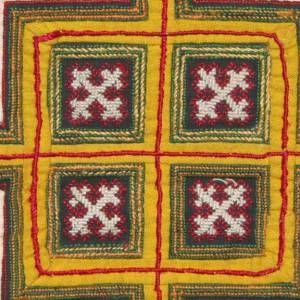 Early 20th century Northern Gujarat, India, embroidered dowry bag (unmade). 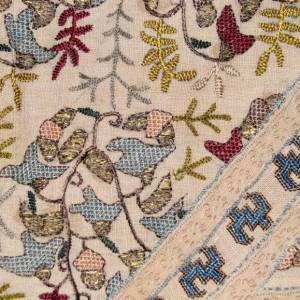 19th century Ottoman (Turkey) square cover embroidered with silk and metallic threads on cotton. 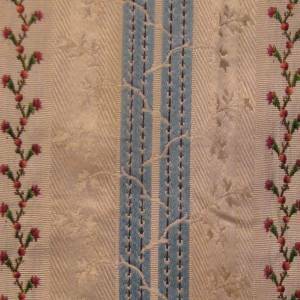 19th century N.W. 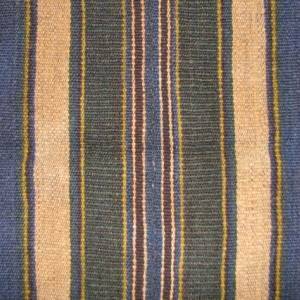 Persia white cotton cover with pale indigo stripes. 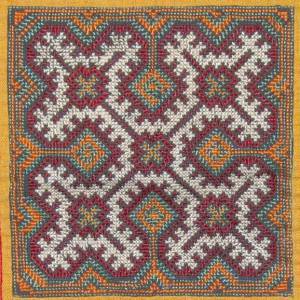 19th century N.W. 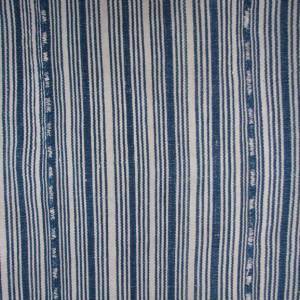 Persian white cotton cover with pale indigo stripes. 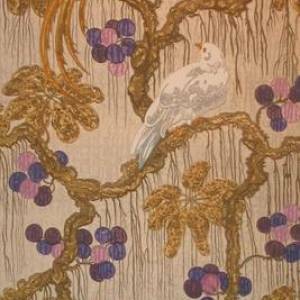 Late 19th century Ottoman silk floss embroidery. 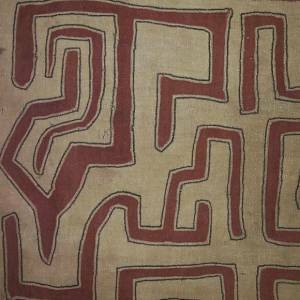 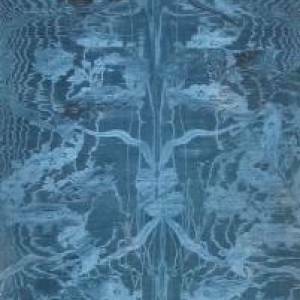 Early 20th century silk ikat panel, Central Asia, Uzbekistan. 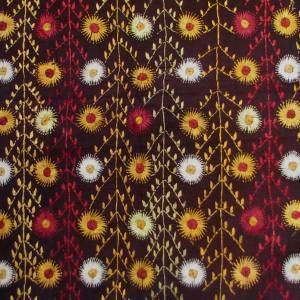 Late 19th or early 20th century from West Punjab, silk floss embroidery on red cotton called a phulkari Bagh (garden). 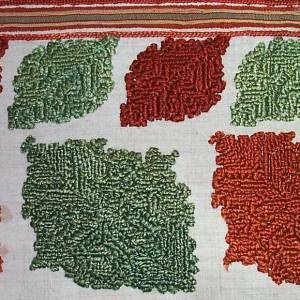 ate 19th or early 20th century from West Punjab silk floss embroidery on red cotton called a Phulkari Bagh (garden). 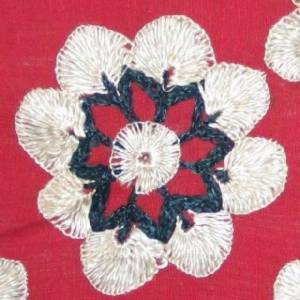 Late 19th or early 20th century from West Punjab (Pakistan) silk floss embroidery on red cotton phulkari called a Bagh (garden). 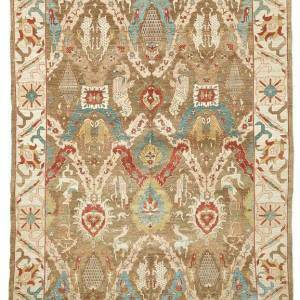 Early 20th century Tashkent, Uzbekistan, Suzani. 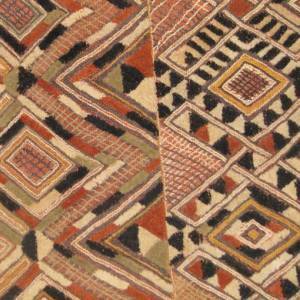 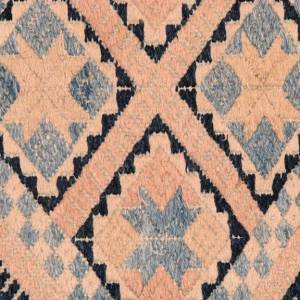 Late 19th or early 20th century matter dyed, homespun wool rug, made from three widths, Lakai people, Tajikistan. 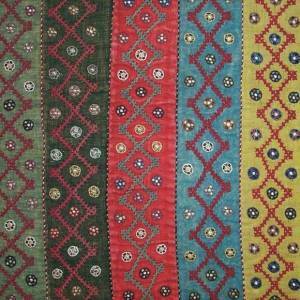 Late 19th century cotton Kaitag from the Caucasus region. 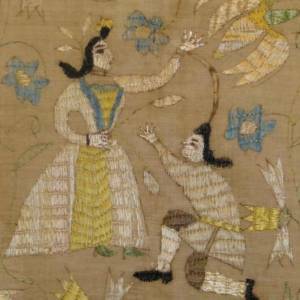 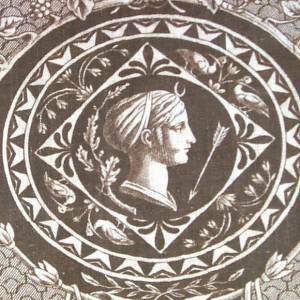 18th century embroidery from Rhodes, Greece.